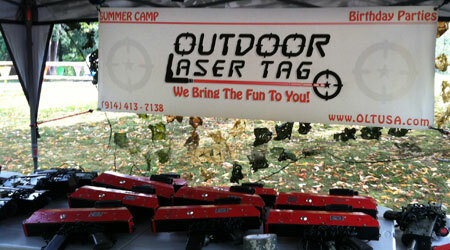 ﻿ Equipment of Outdoor Laser Tag, USA - Leading provider of Mobile Laser Tag for Birthday Parties, Camps and Corporate Events! Equipment | Mission Fields | Armory | How do the lasers work? 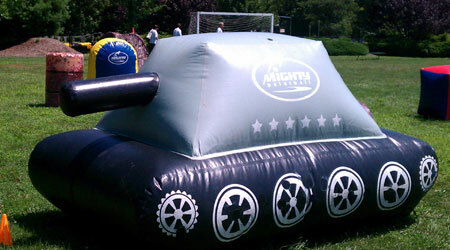 We use only the most durable, premium equipment from Mighty Paintball, the leading provider of commercial grade, portable, inflatable bunkers and obstacles for paintball and laser tag mission fields. 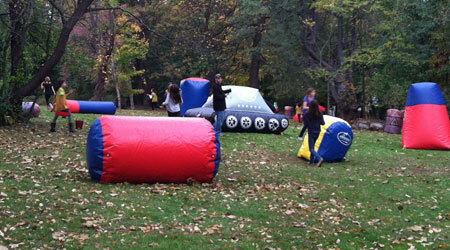 Our staff will create a customized Mission Field on your party using the natural landscape. 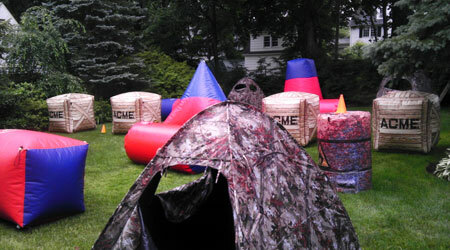 We include a combination of inflatable obstacles and barriers and camoflage pop-up tents and our Mighty Paintball Tank which can serve as the centerpiece of the Mission Field. 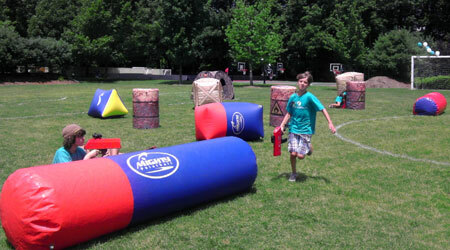 Mission field sizes can range from half the size of a Basketball or Tennis Court (20' x 40') for small groups less than 15 to a Soccer or Football Field for parties over 50 players. There are no toy plastic lasers here or smelly vests needed. 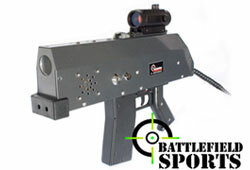 We offer hi-tech, futuristic simulation equipment from Battlefield Sports™ that prior to our launch in 2004 was only offered outside the USA. 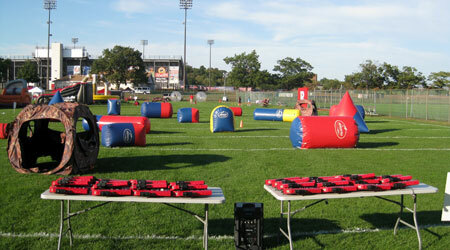 This is Laser Tag in the 21st Century! 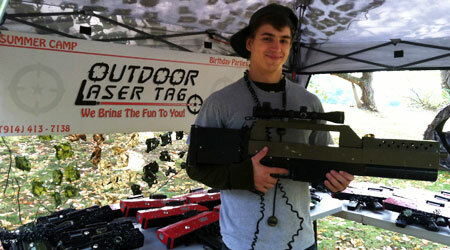 Our hi-tech Laser/Phasers are provide a "WOW" factor when players see them. This is hi-tech with attitude! 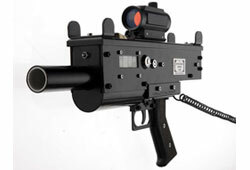 With an effective range of up to 500 feet, they use realistic digitized sounds and offer multiple modes of fire, use real Red-dot scopes, have sensitive sensors to record hits and an LCD screen to show fire power and "lives" and a cool muzzle flash. 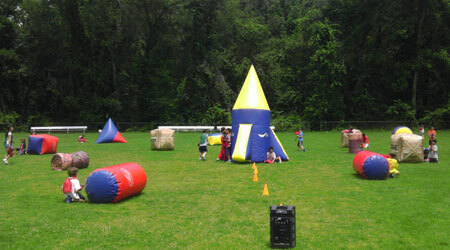 This equipment has been used and tested all over the world to play out fun mission games for all ages and skill levels to always enjoy. How do the Phasers work? 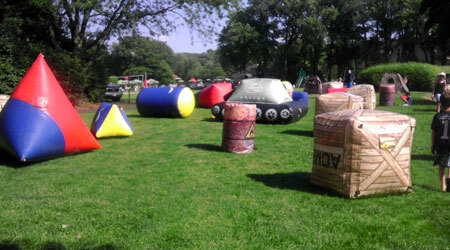 Although this game is widely known as Laser Tag, there are NO LASERS. 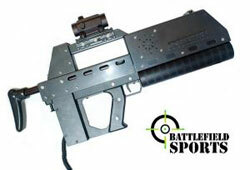 Our Laser/Phasers from Battlefield Sports emit an invisible and harmless INFARED BEAM, similar to a TV Remote Control. 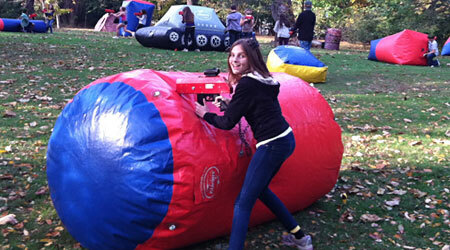 There are no projectiles, paint or pellets, so it is safe and suitable for everyone to enjoy. The phasers have 3 sensors - 2 on a wrap around the body cord (front & back) and 1 on the phaser. The phasers work using an infra-red beam (like your TV remote) and emit a signal to the other player's equipment at distances up to 500 feet. When a gamer is tagged the phaser emits a loud "OUCH" sound to let you know that you've got the other guy, and when you've been tagged. 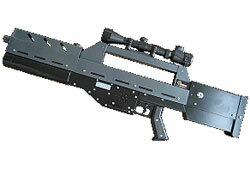 With all of our Battlefield Sports phasers, you can toggle between Semi-auto and Full-auto. When you turn on the phaser (also referred to as booting up) it will default to fully automatic. By clicking the button on the right side of the phaser you can swap over to semi-automatic mode. This is great for being a sniper. The gear is 100% portable, tough, and weather-resistant.